Leadership has been defined as the art of influencing people. It has been a perfect choice to have Mr.Ajit Doval, National Security Advisor, Govt. of India to speak to the young minds on the Art of Decision Making. The session was absolutely interesting and informative. Above all, it was truly inspiring. 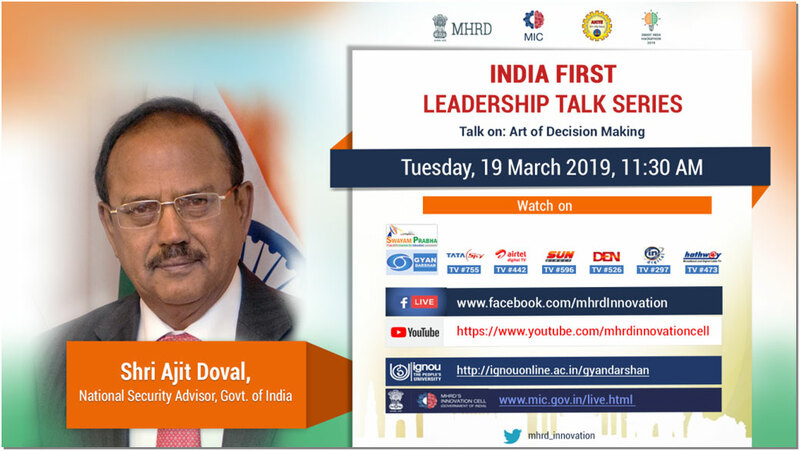 Shri Ajit Doval ji, spoke in detail about the impact of decisions on changing the course of life. He spoke in detail about the different steps of decision making and the importance of collecting relevant information before taking decisions. He also spoke about the dilemmas in decision making and the ways of handling such situations. He was kind enough to share his personal experiences, his journey from a pampered child to a student learning self-defence in his boarding school to his position as the National Security Advisor. While today’s social norm is gadget/outing addiction, it would have been a shocking surprise to many of the young audiences to have known that he never used a mobile phone, occasional use of computers and seldom appearing in public. Shri Ajit Doyal ji, emphasized time and again that the value system and individual discipline are pivotal for an individual’s and the country’s wellbeing. He expressed his concern about the increasing deterioration of ethics and values in individuals which leads to a lot of social crimes. In total, during the session, Shri Ajit Doyal ji, introduced the different dimensions of decision making and emphasised the importance of values and discipline for taking rational decisions.